Annual herb, up to 50cm tall, native to the Mediterranean, naturalized in Europe, Northern America; leaves cleft to parted, minutely hairy, spiny on the margin, up to 30cm long; flowers yellow, lacking distinct rays, flower head 3-4cm in diam., surrounded by numerous spiny basal bracts. The whole herb (Cnici benedicti herba) is used mainly as bitter tonic and stomachic to treat dyspepsia and loss of appetite. 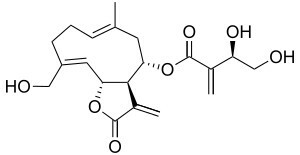 The biological activity is ascribed to the bitter substances, sesquiterpene lactones of the germacran type like the main constituent cnicin (0.2-0.7%) and smaller quantities of artemisiifolin and salonitenolide. The bitterness is partly due to trachelogenin, arctigenin, and nortracheloside. Extracts are traditionally used in Europe in herbal liquers. Centaurea benedicta (L.) L. as Cnicus benedictus L.